Passengers arriving today at Los Cabos International Airport can be your customers tomorrow. GuestEyes offers advertising spaces at the Los Cabos International Airport. Now you have the opportunity to advertise your company in this appealing media. More than 3 million passengers per year use Terminal 1 and Terminal 2 of the Los Cabos International Airport via major airlines. The tourists average stay in Los Cabos is 4 days. Do not waste time waiting for potential customers to find a publication walking down the street. Advertising spaces are strategically located in high traffic points inside the airport, like Migration, Customs and baggage carousels to attract the attention of passengers. 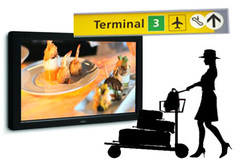 Customize your ad for National tourists or International tourists, Terminal 1 or Terminal 2. Choose the space that best suits your company within the Los Cabos International Airport. In a challenging economy, we work with your advertising budget and goals in mind. Contact us now to learn more about the opportunities to advertise at the Los Cabos International Airport.